Road book, illustrated itineraries, Roads Made Easy by Picture and Pen, by Claude Johnson, published by The Car Illustrated, 168 Piccadilly, London, 1907.
vol.1 for southern England - London to Bristol and west; Salisbury, Exeter and Lands End; Plymouth; Winchester and Weymouth; Southampton; Guildford and Portsmouth; Worthing; Brighton; Eastbourne; Hastings; Folkestone; Canterbury and Dover; etc. 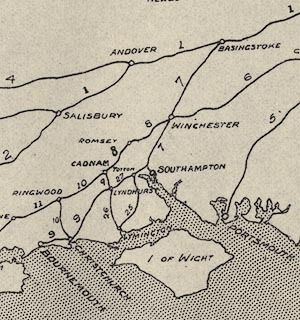 There is an index map to the routes; an outline map of southern England showing the routes, each with its route number. Routes are described, and illustrated by photographs with an added arrow to show the driver where to go.